If you are eating a gluten-free diet, a little extra help in the planning department is always a good thing. 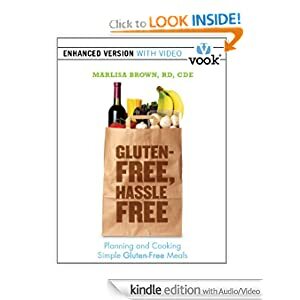 You can download “Gluten-Free, Hassle-Free” for FREE from Amazon. It includes tasty, easy-to-make, and entirely gluten-free recipes for your busy life. This complete digital guide focuses on memorable meal ideas that you can be made quickly and without much practice. You’ll also find gluten-free cooking tips that will come in handy, whether you’re transitioning to gluten-free for health, weight loss, or allergies. Recipes include everything from stuffed Arepas to Blackened Mahi Mahi. Tips and nutritional facts throughout support each meal idea. The book price is currently listed as free, but there is no guarantee as to how long that will last. Download the book for free to your Kindle, iPad, iPhone, PC or other compatible device. You can download a FREE Kindle app for your Web Browser, PC, Mac, iPhone, iPad, BlackBerry, or Android Phone.